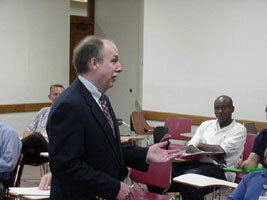 A former salesperson himself, Dr. McQuiston has taught sales to all sorts of groups for over twenty-five years. In that time he has witnessed literally hundreds of sales calls from both real-life and soon-to-be salespeople. A conclusion he has reached is that all successful sales calls have a structure to them that guides both the salesperson and the customer through the sales process. Taking place over a two- or three-day period, Dr. McQuiston takes the participants through the DIRBPAO process, along the way giving guidance and suggestions as to how to implement this process. Through the use of examples and role plays, at the end of the training the salesperson comes away with that structured sales process that is so critical for their success in the competitive modern-day environment.